If your child rides the bus, please remember this is an arrangement between you and the local school district. Each district has its own policy regarding certain aspects of transportation such as procedures for days when FCA is in session and the local district is not in session. Please check with your local district's Transportation Department to determine how such instances might affect your transportation needs. 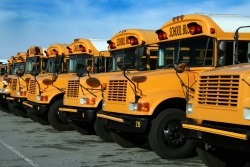 Once you have made transportation arrangements, contact the school office with the busing information for your child (bus #, time of arrival and departure.) A note or call from the parent is required if a bus student is not riding home on the bus. It is very important that you have an emergency plan for your child in case he arrives home and no one is there. Please contact the FCA Attendance Office each and every time there is a change to your child’s after school transportation. The Attendance Office is located at the main entrance, Door B. Emails may be sent to busattendance@fcaknights.us or call (740) 654-2889 ext. 263 to make adjustments to afternoon busing arrangements. If you are interested in public school bus transportation, you will need to contact the school district in which you live. If it is not available, ask your district about how to receive transportation reimbursement. It is the responsibility of the parent to inform the Attendance Office of a K-5 student’s afternoon bus arrangements. Once this arrangement has been established at the beginning of the year, the parent must call if any change is to be made.